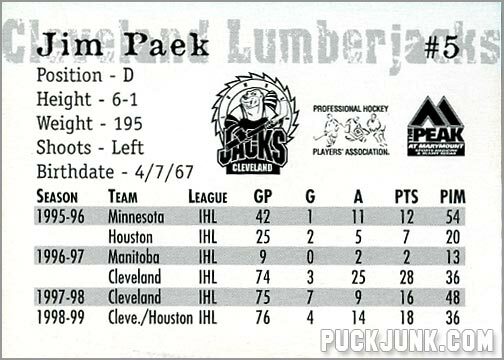 Given away at a home game in November 1999, the Cleveland Lumberjacks team set contains 24 cards. 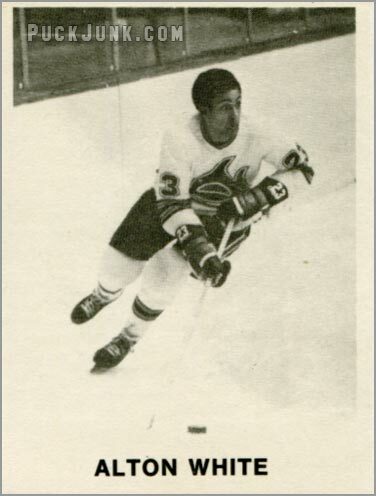 The ‘Jacks were a minor-league hockey team in the old International Hockey League (IHL). 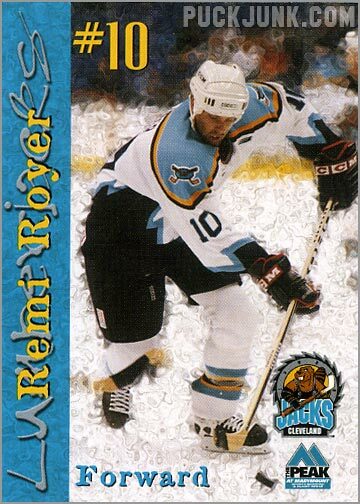 Formerly in Muskegon, the Lumberjacks were the top minor-league affiliate of the Pittsburgh Penguins for 14 years until 1997. 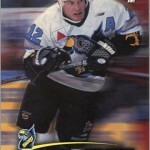 In 1999, the team became affiliated with the Chicago Blackhawks. Thus, this set has mostly Blackhawks’ prospects and minor leaguers. 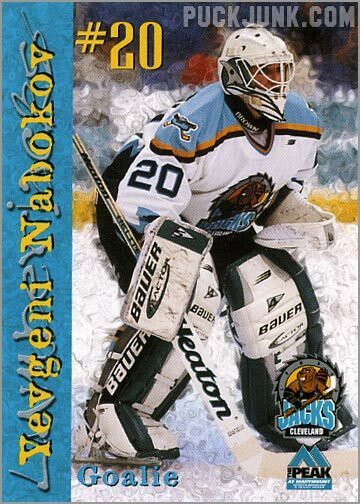 It does, however, have a card of future superstar San Jose Sharks goalie Evgeni Nabokov. 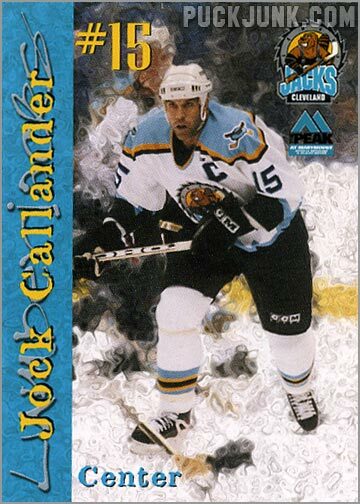 Because the ‘Jacks were affiliated with the Chicago Blackhawks that season – and the ‘Hawks were pretty abysmal during that time – most of the players in this set are forgettable. 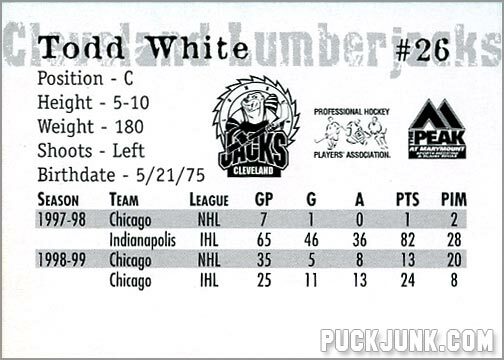 One exception, though, is Lumberjacks goalie Evgeni Nabokov. 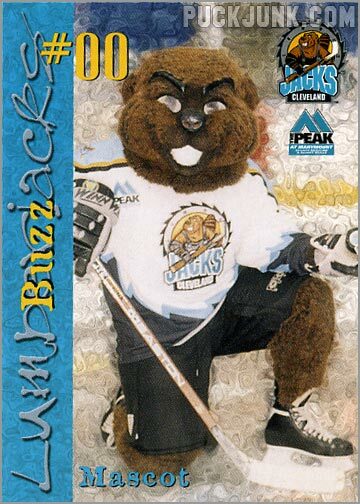 Here, his first name is spelled “Yevgeni”, and he was on loan from the San Jose Sharks. 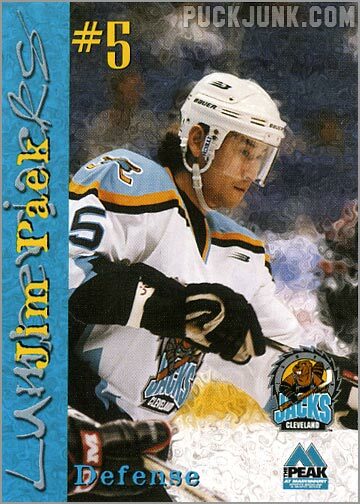 The Sharks were saturated with quality goaltenders – Mike Vernon and Steve Shields played in San Jose, while Johan Hedberg and Mikka Kiprusoff played with the Sharks’ top affiliate in Kentucky. 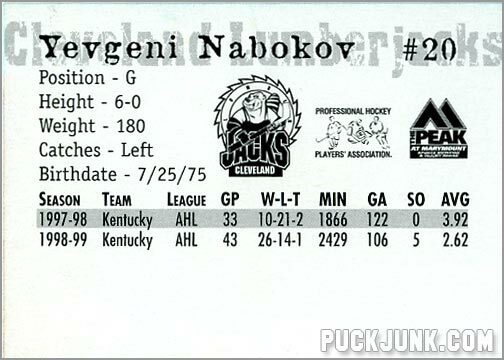 This left Nabokov with little chance to play – and develop – hence his loan to Cleveland. 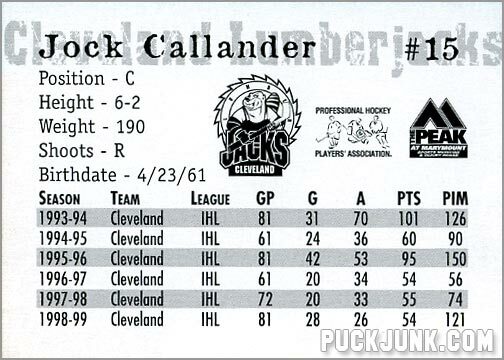 Another noteworthy card is of team captain Jock Callander. 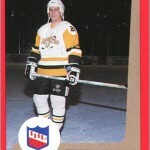 Callander played 14 seasons for the Lumberjacks franchise (seven in Muskegon and seven in Cleveland), and ended up as the team’s all-time leading scorer when he retired from playing in 2000. 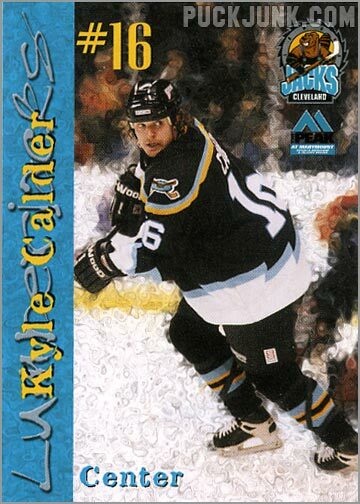 While he never played much in the NHL (he did win a cup with the Penguins in 1992, though), his long scoring prowess in the IHL made him a popular player among ‘Jacks fans. Like many things from the 1990s, the design is overdone, with way too much going on. The player’s name runs vertically along the left edge, but it in a serif font layered on top of the word “Lumberjacks”, which itself is in a “scribbly” font. That makes the player’s name hard to read. 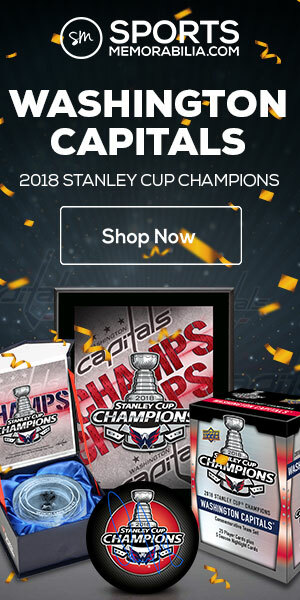 The action photos have the background “blurred” out, using some sort of mosaic effect, as if the designer had a little too much fun with Photoshop filters. 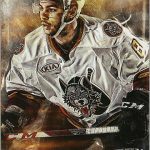 Adding to the clutter is the player’s number, position, the Lumberjacks logo and the sponsor logo (The Peak Sports Medicine & Injury Rehab) – all haphazardly plopped over the photo. 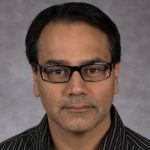 Poor legibility, blurry background, abundance of clutter – this is how things look when I’m drunk! The back of each card is no-frills, but still very informative. 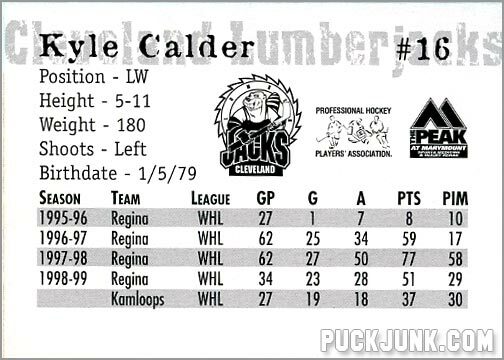 Player name, number, position, height, weight, shoots (catches for goalies) and birth date are all neatly listed. The back also has stats – up to the last six years up to and including 1998-99. Whereas the front of each card is a bit of an eyesore, the back is neatly laid-out and easy to read. 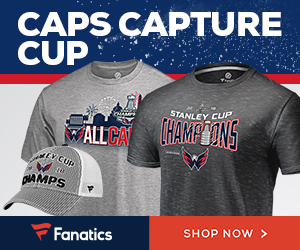 The set is worthwhile if you are a fan of the Lumberjacks or of Nabokov…or perhaps of crummy Blackhawks prospects who never pan out. 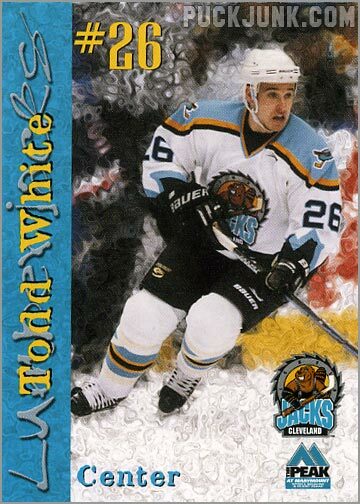 The design is, well, overdesigned and kitschy – but I guess that’s par for the course with minor league team sets. 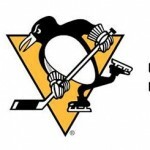 Hockey logos inspired by Shark Week!